Dry Needling: When you have neck pain, the muscles in your neck are often painful to the touch. The irritable, hard “knots” within a muscle or connective tissue that may cause pain over a large area are called trigger points. These painful areas can limit your daily activities and movement. Dry needling, also called trigger point dry needling consts of pushing a very thin needle through the skin to stimulate a trigger point. The needle may relax the tight muscle bands associated with trigger points. As a result, dry needling may be helpful in decreasing pain and increasing motion for patients with neck pain. The researchers studied 17 patients. 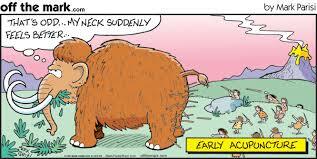 All patients’ neck pain began within 7 days of the start of the study. Half of the patients received trigger point dry needling treatment, and the other half received no treatment. The patients who received the dry needling had better results. Immediately after the treatment, their pain decreased by 33%. One week after the treatment, their pain was 66% less. Also, those patients treated with dry needling were better able to bend their heads forward and backward and to turn their heads toward the painful side of their necks.